16 days of activism against gender based violence is an international campaign to challenge violence against women and girls. The campaign runs every year from 25th November (international day for “Elimination of violence against women”) to 10th December (Human Rights Day). In the current year Vacha has engaged with educational institutes like schools and colleges, Bastis and activists interested stakeholders through various activities conducted in different locations in Mumbai as a part of 16days of activism. Please click the link below for the detailed report. Click here to see the photographs…. Poems are more than just beautiful words woven together in meters; they express the desires, aspirations and dreams of the person whose ink is colored with myriad emotions. Here’s a poem by a young girl of 14 years living in Mumbai, who is not only questioning the social norms which shackles the liberty of young girls, but is also hopeful at the same time about a positive change which could be brought by the girls themselves. Read on to see how she and her friends are determined to move “beyond the difficulties”……. मैं जाऊं तो जाऊं कहाँ? जब “सयानी” होने की बात आती है. यह कहकर दुनिया हमें डराती है. छोटी उम्र में कर देते हैं पराया? अब और नहीं इनकी परवाह. बदलेंगे समाज की सोच साथ चलकर. 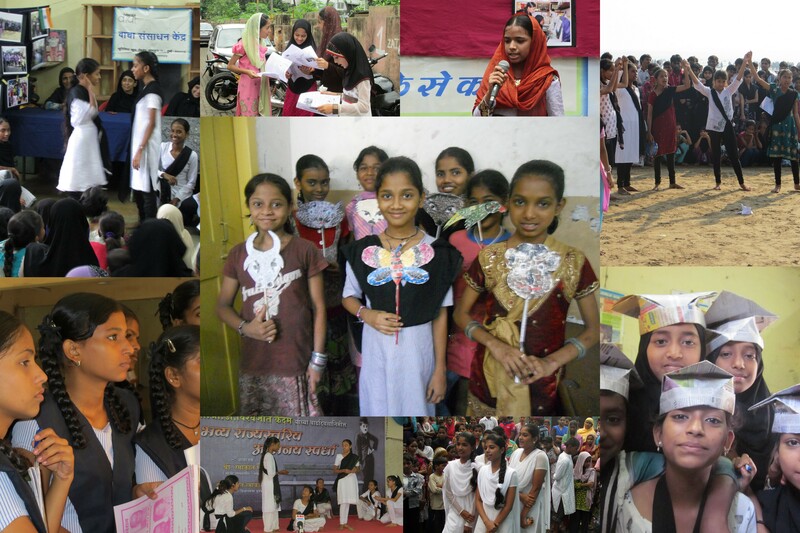 We at Vacha celebrated this day by distributing pamphlets designed by our girls. 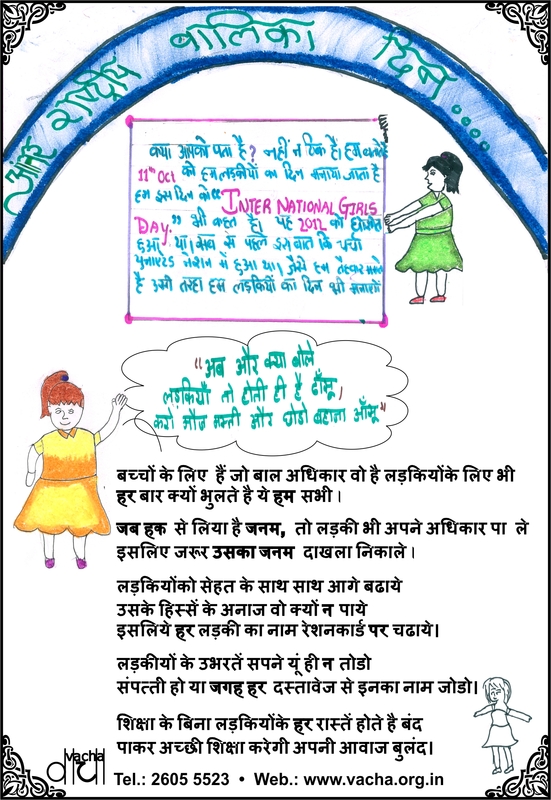 Girls had created poems and slogans for this purpose and they also included information about the International Day of the Girl Child in their pamphlets. Girls and boys distributed hundreds of these pamphlets across 10 bastis of Mumbai, India. An added advantage is that in India, the date falls during a festive time, during ‘Navratri’ which is a celebration of the Mother Goddess. This is a positive thing because Girl’s Day then coincides with many other important festivals in our country. The UN might not have thought about this aspect, but this is surely important for Indians. While we do have the International Women’s Day, girls are a separate entity with different needs and they require a separate platform to have their rights recognized. For the second observance of the International Girl’s Day, the UN has decided to focus this year on Innovating Girls’ Education. Education does not reach all girls and we need a lot of changes and modifications in our education system for it to become accessible to girls. More importantly, we need to make changes in the society so that it becomes a support system for our girls. But is girlhood all about issues and woes? Certainly not, there is a lot to celebrate about girlhood. There are countless things that make girls proud of who they are. Some realize it sooner, some take a little time, but every girl needs to celebrate herself! Hence a day to make them feel special is a good idea. We work with girls everyday and we know how much they have to go through to just get to school every day, or even step out of the house. There are many, many girls who have to fight everyday for their basic rights but they are happy and empowered. So we are celebrating not just girlhood today, but we are celebrating freedom, empowerment, and the courage shown by countless girls. We are also sending the message across cultures: I am a girl and I love myself.